How much will projects cost to build? How much are the overhead costs? What’s leftover is the profit. More specifically, if you’re generating $2 million in revenue, and construction costs are $1.3 million, then your gross profit is $700K. If your overhead (including salaries, rent, insurance, etc.) is $500K, then net profit is $200K, or 10% of revenue. But for many businesses right now, that’s not the case. a) Material costs are higher than estimated. b) Subcontractor costs are higher than estimated. c) Clients are more difficult, which results in indecision, delays, and more costs. d) Projects are taking longer, which adds cost. e) Labor costs are higher than anticipated. Now let’s look at the financial formula. 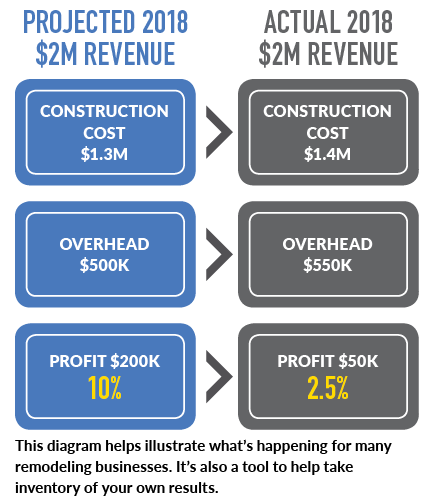 If you’re generating about $2 million in revenue, and construction costs (based on the above reasons) are $1.4 million with an overhead of $550K (based on the above reasons), then your net profit drops to $50K (or 2.5%). This is not a happy picture when you’re working harder than ever. 2) Use more allowances. While too many can be disruptive, allowances move some of your cost risk to the client. After all, how can you predict price increases? 3) Lock in prices. Get trade contractors and suppliers to commit to their prices for 6 or 9 months. It may cost a few dollars, but it will make expenses more predictable. 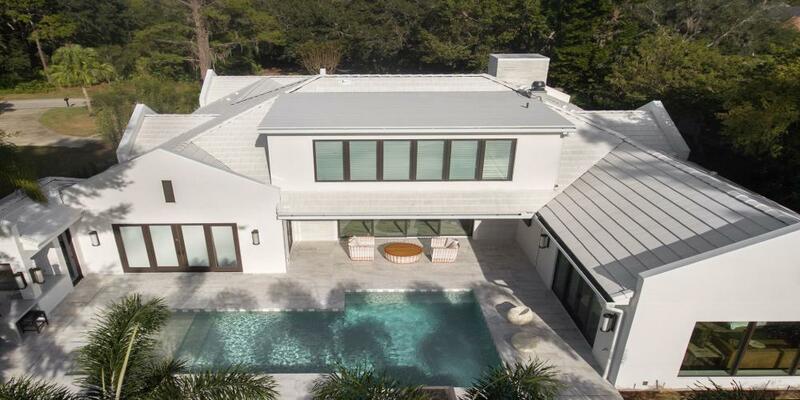 Multiple factors, including subcontractor costs, labor costs, and project timelines, played into lower 2018 profits for many remodelers. 4) Position yourself with clients. Try to be seen more as a trusted advisor than a bidder. A wealth advisor can’t guarantee what the stock market will do. You shouldn’t be accountable for what you can’t control, like cost creep. 5) Get buy-in from the team. Have a meeting with key people focused specifically on this subject, and hold people accountable for the solutions. There are other things you can also do to impact this equation, such as creating incentives, looking for cost efficiencies, and getting projects completed faster. The bottom line is you are in business to make a profit. Make this a top priority to fix so you’ll be well positioned for 2019.